Car Seat Boosters 3yrs to 12yrs. Car Seat & Bases-Isofix. Car Seat Accessories. Double Pushchair & Tandem. Safety Gates/ Fireguards & Room Dividers. Machine washable. Play Mats & Gyms. Back Carrier/Baby Carrier/Accessories. Brought second hand but in fantastic condition, used a few times but now do not need. Machine Washable. If you would like for-your-little-one to arrange a 3rd or more collecting this will be at the cost of £25 for each attempt. Quick Links. 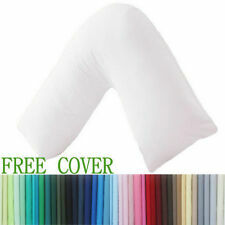 Infant Baby Toddler Safe 100% Cotton Anti Roll Pillow Sleep Flat Head UK Condition is New. Dispatched with Royal Mail 2nd Class. 【Blue】C-Shape Pregnancy Woman Support Pillow Ease Features: A perfect pregnancy, nursing, or just plain snuggling pillow Perfect for supporting your back, hips and belly. 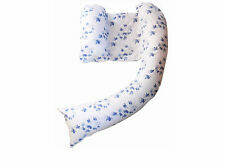 Snuggle up for a good nights sleep! Cover made of 100% Cotton Zipper cover which can be removed and easily washed and dried Doubles as a support for breastfeeding Can also be Used as the Boyfriend Specifications： Color: Blue Inner Materials: PP Cotton Inner cover: 50D Non-woven Outer cover：Fabric 100% Cotton Dyed Product Size: 57'' x 30'' x 7'' ( L x W x H ) Package Included: 1 x Maternity Pillow.